When Marvel Studios got the rights back for Daredevil from Twentieth Century Fox everyone in the comic book community breathed a collective sigh of relief after 2003's much maligned big screen outing starring Ben Affleck as the titular blind crime-fighter of Hell's Kitchen. 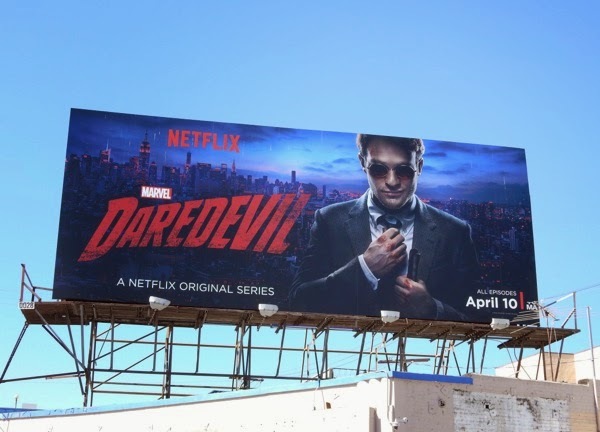 Now in a new initiative which will bring more of Marvel's comic book universe to the small screen as Netflix series, Charlie Cox stars as 'Matt Murdock', the blind lawyer by day, horned vigilante by night. In the mighty Marvel tradition he was blinded by a chemical spill as a child, but instead of limiting him, the freak accident heightened his senses to superhuman levels and with expert martial arts training he patrols his city in the darkness, whilst his alter-ego protects its citizens in the courtrooms in the daytime. 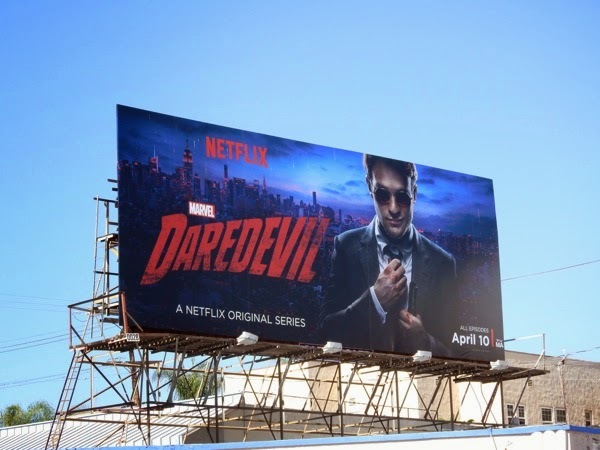 This marvelous series premiere billboard for the 'Man without fear' was snapped along La Brea Avenue on May 2, 2015. Get ready for more 'street level' superheroics in the future from Netflix, in the form of new 'Jessica Jones', 'Luke Cage' and 'Iron Fist' shows, all culminating in a united Defenders series. 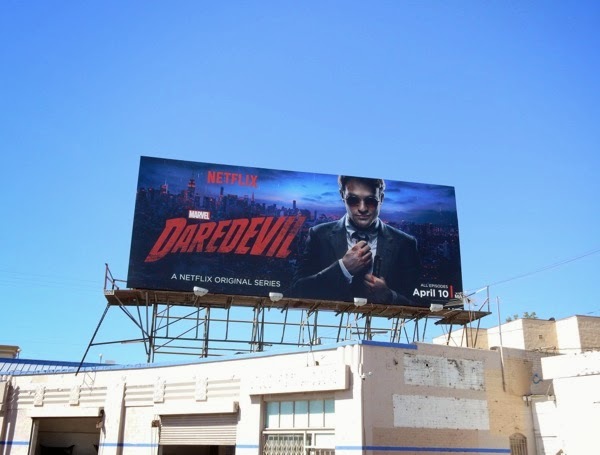 If you're a fan of superheroes on the big and small screen, be sure to also check out these other Marvel TV show and movie billboards filling L.A.'s skies in recent times.